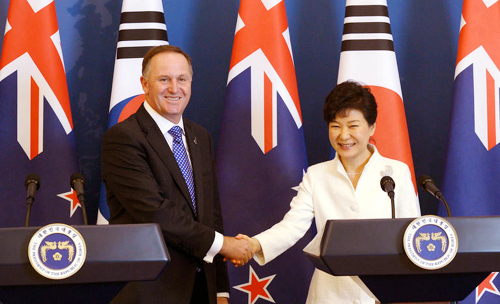 Korea and New Zealand signed a free trade agreement on Monday. The trade ministers of both sides inked the pact after a meeting between President Park Geun-hye and New Zealand Prime Minister John Key at Cheong Wa Dae. Key said, "The free trade agreement will deliver real economic benefits to both our countries... and will make it easier for Koreans and Kiwis to do business with each other." Both leaders vowed to ensure that the FTA is ratified by September. Korea is expected to benefit in terms of exports of automotive parts, machinery and trucks, and New Zealand will scrap all tariffs on Korean imports seven years after the FTA goes into effect. Tariffs on cars (five to 12.5 percent), construction machinery (five percent) and trucks (five percent) will be eliminated within three years, and duty on washing machines will be abolished immediately. But Korean farmers are expected to take a hit. New Zealand beef ranks third behind Australian and U.S. beef imports here. At present, Korea levies a hefty 40-percent tariff on it, but that will be scrapped within 15 years. The 45-percent tariff on New Zealand kiwis will be scrapped within six years, but honey, rice, apples, peppers, garlic and some other agricultural products were left out of the FTA. Park said the government will come out with additional measures to protect Korean farmers once a study is completed in mid-April. Meanwhile, New Zealand agreed to boost the work-visa quota for Koreans from 1,800 to 3,000 people a year and give work visas to 200 Korean professionals including traditional herbal doctors and bio-technicians for up to three years. New Zeland also allowed Korean trawlers to continue fishing in its exclusive economic zone.